1924: (Harold F) Pitcairn Air Service (air field, flight school, FBO), Bryn Athyn PA. 1925: Pitcairn Air Lines (sold to Eastern Air Transport in 1929 as origin of Eastern Air Lines). 1925: Pitcairn Aircraft Inc, Pitcairn Air Field #2, Willow Grove PA. 1929: Autogyro operations as Pitcairn-(Juan de la) Cierva Autogiro Co. c.1930: Autogiro Co of America (aka AGA) as patent licensee (to Buhl, Kellett, Sikorsky, etc). 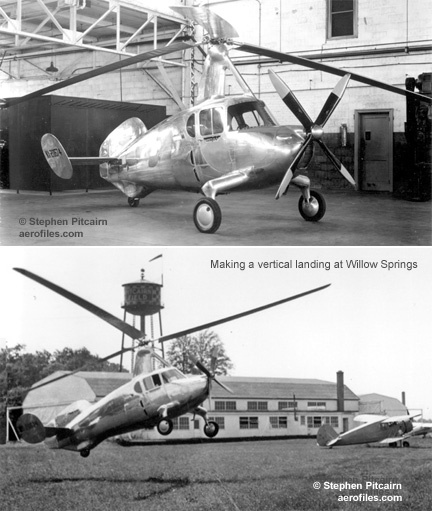 Feb 1941: Pitcairn-(Agnew E) Larsen Autogiro Co Inc. Dec 1941: Renamed AGA Aviation Corp (pres: Virgil H Frazier). 1946: Acquired by G&A (Gliders & Aircraft) Div, Firestone Rubber Co. 1947: Firestone Aircraft Co.
G-2 1935 = PA-33 with 165hp Wright R-975 for evaluation. POP: 1 as XG-2. OP - USN version of PA-34 with 45'0" rotor. XOP-1 1931 = Testing stability in carrier use. POP: 3 [A8850, A8976/8977], the first modified as wingless XOP-2, the last two flown by USMC. XOP-2 1936 = POP: 1 modified from -1 [A8850]. 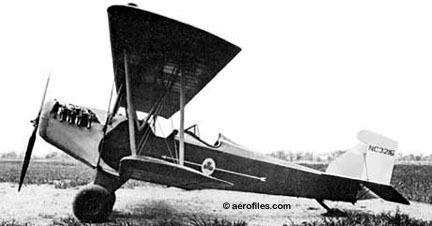 PA-1 Fleetwing 1925 = 4-5pOB; 160hp Curtiss C-6; span: 38'0" length: 25'11" load: 1110# v: 110/93/45. Three cockpits. Agnew Larsen. POP: ?? [173, 1172/1173, 1509, et al]. PA-2 Sesquiwing (aka Arrow) 1926 = 2pOswB; 160hp Curtiss C-6; span: 32'0" length: 22'6" load: 754# v: 145/120/60 range 360. Quick-change convertible to 90hp Curtiss OX-5 in 31 minutes; length: 22'10" load: 746 v: 120/x/60. POP:  1 for 1926 Nationals, but did not finish because of motor problems [NC10222]. PA-4 Fleetwing 2 (aka Deluxe) 1927 (ATC 2-21) = 3pOB; 90hp Curtiss OX-5; span: 33'0" (?>30'0") length: 22'2" (?>21'10") load: 785# v: 102/87/45 range: 400. POP: 11 [C1514, X2359, C3216, C3228, C4920, NC7032, NC7443, NC7558, NC7756/7757]; prototype [NC3216] converted to PA-4W. PA-4K, PA-4W Fleetwing 2 1928-30 (ATC 2-193, 2-230) = PA-4 approved for 100hp Kinner K-5 (2-230) and 110hp Warner Scarab (2-193). POP: 1 each -4K [NC10130] and -4W [NC3216] for conversions as engine test-beds. PA-5 Mailwing, Sport Mailwing 1927 (ATC 18) = 1pOB; 220hp Wright J-5; span: 33'0" length: 21'11" load: 822# (?>1008#) v: 131/105/50 range: 435 ceiling: 18,000'. $9,850-10,000; POP: at least 21 [NC94, NC500, NC549K, C1515, C2895, C4321/4325, C5062, C5117, C5129, C5564, C5636, C5677, C5808, C5863, NC6617/6618, NC6708, et al]. 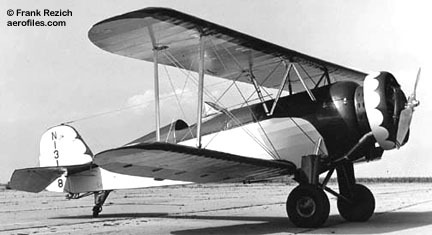 Sport was 3p "civilianized" version of PA-5 mail plane. PA-6, 6B Super Mailwing 1928 (ATC 92) = Similar to PA-5 but with a larger cargo hold. 1pOB; 220hp Wright J-5; span: 33'0" length: 23'4" load: 695# v: 128/109/52 range: 600 ceiling: 16,000'. POP: 51 [NC19/20, NC26, NC36E/38E, NC93W, NC127/129E, NC210H/214H, NC215E, NC298E, NC338E, NC353E/355E, NC377V, NC482E/483E, NC557E, NC585, NC643E/644E, NC680E/683E, NC800H/804H, NC875M, NC878M, C2896, NC7152, NC7557, NC7866/7868, NC7965/7966, NC10378, NC13912/13913, NC15307]. PA-6S Super Mailwing 1928 (ATC 2-22) = 3p sport version of PA-6> mail plane. (2-22) replaced by (92). PA-7 Super Mailwing 1929 (ATC 196) = 3pOB; 225hp Wright J-6; span: 33'0" length: 23'9" load: 1129# v: 135/155/57 range: 520. POP: 2 [NR213M, NC684E]. 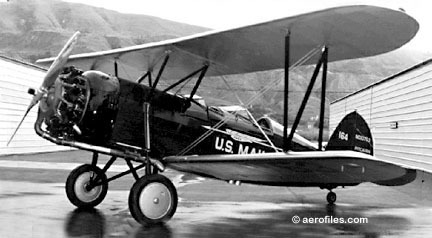 PA-7M Super Mailwing 1929 (ATC 196) = 1p PA-7 as mail plane. POP: 10 [NC94W, NC351V, NC378V, NC545K, NC825N/826N, NC876M/877M, NC7967]. PA-8, -8M Super Mailwing 1930 (ATC 364) = 1pOB; 300hp Wright J-6; span: 35'0" length: 24'10" load: 1706# v: 145/122/60 range: 600 ceiling: 16,000'. $12,500; POP: at least 6 [prototype X10056, NC10750/10754]. PA-18 1932 (ATC 478) = 2pOlwMAg; 160hp Kinner R-5; span: 21'3" length: 19'5" rotor: 40'0" load: 556# v: 95/83/0-20 range: 225 ceiling: 12,000'. $6,750 with flight instruction; POP: 51, of which 6 were converted to PA-39. The fatal crash of a Pitcairn autogyro in Oct 1935 ended one of aviation's longest safety records, when pilot Robert Swenson unwisely tried to stretch a glide over power lines after an engine failure. PA-19 1933 (ATC 509) = 5pClwMAg; 420hp Wright R-975; span: 38'8" length: 25'9" rotor: 50'8" load: 770# v: 120/100/0-20 range: 350. R B C Noorduyn; ff: 9/x/32 (p: James G Ray). $14,950; POP: 4 [NC2503, NC2740, NC13149, X13182], of which the prototype [NC13149] was scrapped. PA-20 1933 = 2pOlwMAg; 160hp Kinner R-5; span: 22'9" length: 19'0". Improved version of PAA-1. PA-21 1933 = PCA-2 with 420hp Wright R-975-E2. PA-22 1932 = 2pCMAg; 84hp Pobjoy Cataract; span: 0' length: 18'0" rotor: 32'0" load: 540# v: 105/90/0-25 range: 350. Experimental wingless with a three-blade, foldable rotor system. Side-by-side cabin; width: 7'10". 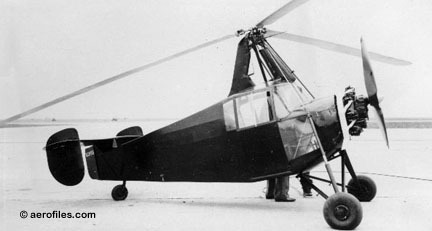 First roadable autogyro built by Pitcairn. POP: 1 [X13199]. 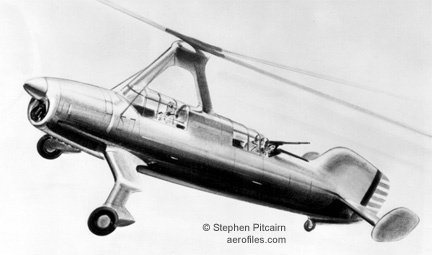 SEE Autogiro AC-35. PA-24 1933 (ATC 507) = 2pOlwMAg; 160hp Kinner R-5; span: 22'9" length: 18'7" rotor: 40'0" load: 543# v: 100/87/0-25 range: 235. Modified twin-tail version of PA-20 and PAA-1 with a changes in powerplant and rotor system. POP: 2 [NC11631, NC11634], plus about 20 modifications of earlier models. PA-33 1935 = 2pOAg; 420hp Wright R-975; rotor: 50'0" length: 22'8" v: 144. POP: 1 to AAC as YG-2. PA-34 1937 = 2pOAg; 420hp Wright R-975; rotor: 50'0" length: 22'8". POP: 3 to USN as XOP-1. PA-36 Whirl Wing 1939 = 2pCAg; 165hp Warner Super Scarab; span: 0' length: 20'5" rotor: 43'0" load: 625# v: 122/102/0-15 range: 375; side-by-side cabin, width: 8'3". Agnew Larsen. POP: 1 [NX20674], plus another partially constructed; aka Pitcairn-Larsen PA-36 in 1941. 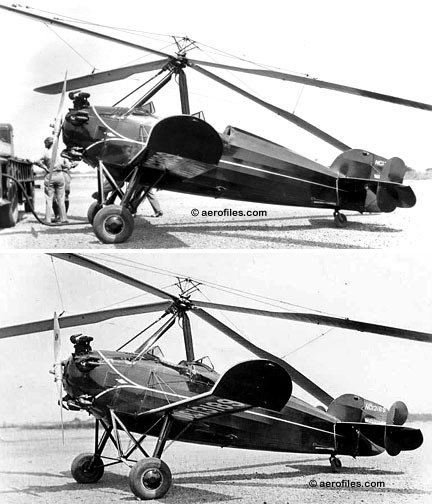 All-metal, roadable version of Autogiro AC-35 for military trials, which proved unsuccessful with the advent of the helicopter and it was cut up for scrap during WW2. Fuselage was built by Luscombe Co.
PA-39 1940 = 2pClwMAg. POP: 6 converted from PA-18 as convoy escorts for RNAS. PA-44 1943 = 2pCAg; 300hp Jacobs R-915A pusher engine; rotor: 48'0" length: 28'6" v: 103/x/0-10. Gross wt: 3038#. POP: 2 built for AAC as XO-61 and YO-61, but not delivered. PAA-1 1931 (ATC 433) = 2pOlwMAg; 125hp Kinner B-5; span: 22'9" length: 18'7" rotor: 37'0" load: 572# v: 90/75/0-20 range: 250 ceiling: 10.000'. $6,750; POP: 25. PAA-2 1931 = 120hp Chevrolair (Martin 333); length: 20'3". A tricycle gear was added to offset the weight of the motor. POP: 1 [X10756]. -Cierva C-8 1928 = 2pOlwMAg; 220hp Wright J-5; span: 28'0" length: 28'4" rotor: 38'8". POP: 1 . 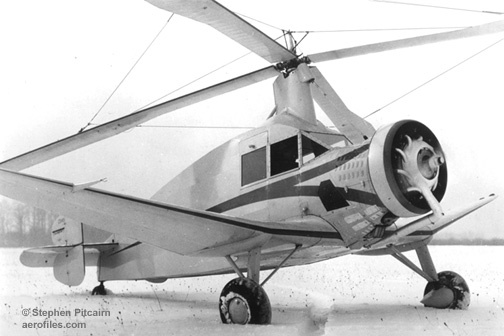 Modified from a Spanish Cierva C-8 (Spain ff: 1/17/23), purchased by Pitcairn Co for evaluation, it was the first rotary-wing craft to fly in the USA, 12/18/28 (p: Harold Pitcairn). -Cierva PCA-1 1930 = 2pOlwMAg; span: 32'0" length: 23'0". Redesign of Cierva C-8 using PA-5 Sport Mailwing fuselage. POP: 3 [X94N/96N]. 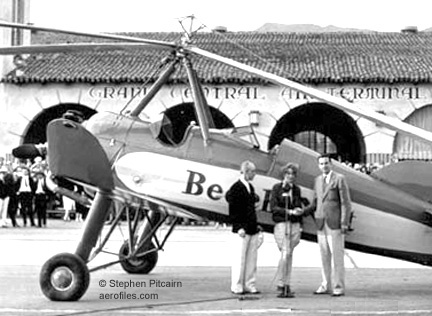 First commercial autogyro in USA. -Cierva PCA-2 1931 (ATC 410) = 3pOlwMAg; 300hp Wright J-6 R-985; span: 30'0" length: 23'1" rotor: 45'0" load: 907# (?>767#) v: 118/98/0-10 range: 290. $15,000; POP: about 20 [NC26=NC2624, NR784W, NC799W, NC10761, NC10768, NC10780/19781, NC10785/10791, NC11608/11611, NC11613]. First "non-conventional" aircraft to earn government approval. Set world altitude records of 18,415' on 4/8/31 (p: Amelia Earhart), and 21,500' on 9/25/32 (p: Lewis Yancey); three were used by Earhart for a cross-country flight in 1931 [R10761, NC10780, x]. -Cierva PCA-3 1931 (ATC 446) = PCA-2 with 300hp P&W Wasp Jr; rotor: 48'0" load: 942# v: 120/100/0-10 range: 300 ceiling: 15,000'. $15,000 (it finally sold for $5,000); POP: 1 [NC11612] c/n E-45.